With the release of the third book in the Before the Sun Rises Series, I’ve been working on a spin-off serial series based in the same paranormal world as the original series. 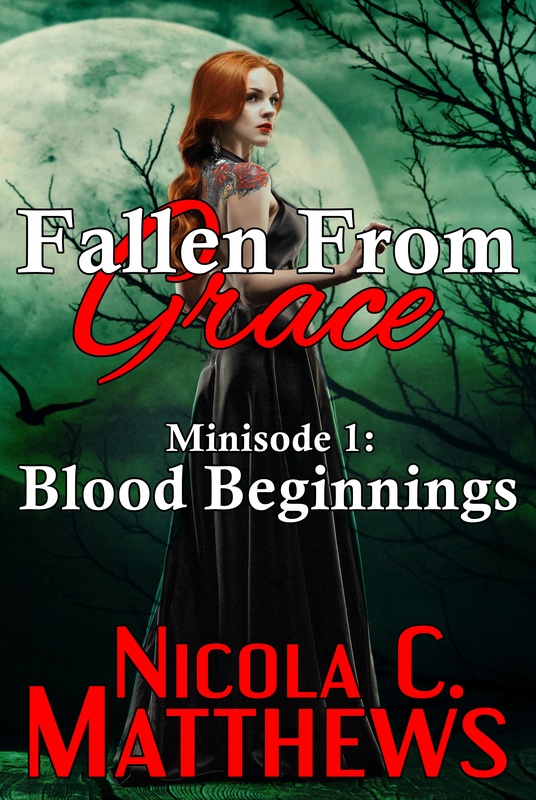 Fallen From Grace is a science fantasy series set in Abyss City seventy-five years after the end of Clan of the Claw. Join a brand-new cast of characters and some old favorites as they learn to maneuver in a world where the paranormal elements have been forced to live in secrecy once again. Battles will be fought, alliances forged and new enemies arise all in a bid to live just one more day in a universe hell-bent on destroying them all. Minisode 1 – New Beginnings is tentatively scheduled to release early 2018. Exact date and release schedule for the serial to be announced. We were outcasts now, forced to once again live in the shadows of the night. The world was changing thanks to the Shield of Humanity, and whether or not it would be for the benefit of the supernatural community was still to be seen. There were still vampires, still werewolves of all kinds, but the humans – the humans were changing. So many experiments done in the name of helping mankind, so many failed attempts at eradicating supernaturals and humans alike. We were the chosen the ones, those Fallen From Grace, those who would rise up against everything meant to destroy our world. We are just the beginning, the first few who would discover the dark secrets left behind in our city, the front-runners of the battle which was yet to come. Aleria had been around the vampires for nearly a decade, welcomed into their world if still slightly apart from it, until one night she happened to be in the wrong place at the wrong time. She saved him, giving up her own mortal life, and he in turn gave her an immortal one. Now she was part of his coven, but not everyone was so eager to welcome her with open arms. Addalynn had run for her life after watching the townspeople slaughter her father right on their front lawn. Terrified she would be next if they discovered her secret, she fled the city, scratching out a meager existence in the forest on the outskirts of the city she once called home. Then he found her, welcomed her into his pack, and her world was never going to be the same again. Who would win the war to save humanity when everyone seemed hell-bent on destroying each other? Who could be trusted when no one was what they appeared to be? In this new world where the lines of humanity and the supernatural have been blurred, it was becoming increasingly harder to figure out who were friends – and who was the enemy. Want to delve deeper into this new series? Click here to read chapter 1 for free now.